Our staff views the role of an early childhood program as one of facilitating children and their families in exploring and discovering the human potential in each of us. Individual activities and collective experiences are designed to challenge each child at her/his own developmental level, encourage participation and a strong, secure sense of community. Parents are encouraged to view teachers as a source of support in the challenging task of child-rearing . NATURE AT IT'S FINEST....IN OUR PLAY YARD! We strongly believe that learning is a natural out-growth of exploration. We have designed our program as a place where children can explore and discover through play, projects, manipulative engagement, sensory stimulation, pre-academic skill exposure and circle time activities. It has been our experience that academic achievement in later years comes most easily to children who have a firm grounding in concrete play experiences. We are proud to consider this center culturally diverse in our approach to certain units and/or holidays encompassed by our annual curriculum. Children, from the earliest grades, need to be introduced to the beauty of all cultures. Respect and appreciation for others can serve as the foundation for global understanding. Developing appropriate and acceptable social skills of communication, compromise and conflict-resolution are all important components of our curriculum and contribute effectively to the independence and self-reliance of the child. Making choices, using good judgment and thinking clearly about cause and effect are all key elements of a responsible personality and the exercising of these skills greatly decreases the need to impose child guidance by supervising adults. In order to maximize children’s growth, development and potential, expectations and guidelines for behavior will be clearly stated and positive encouragement will be frequent and forth-coming. We will explain to the children that the range of choices and freedoms available to them throughout the course of the program will depend to some extent upon the good judgment shown by them, collectively and individually. In order to encourage self-control through understanding, group discussions on how to handle challenging social situations - both hypothetical and experienced - will occur frequently with an emphasis on dialogue and input from children. Suggestions and ideas will be implemented where it is feasible and /or appropriate. This will help children feel they are protected both as individuals and as a group. 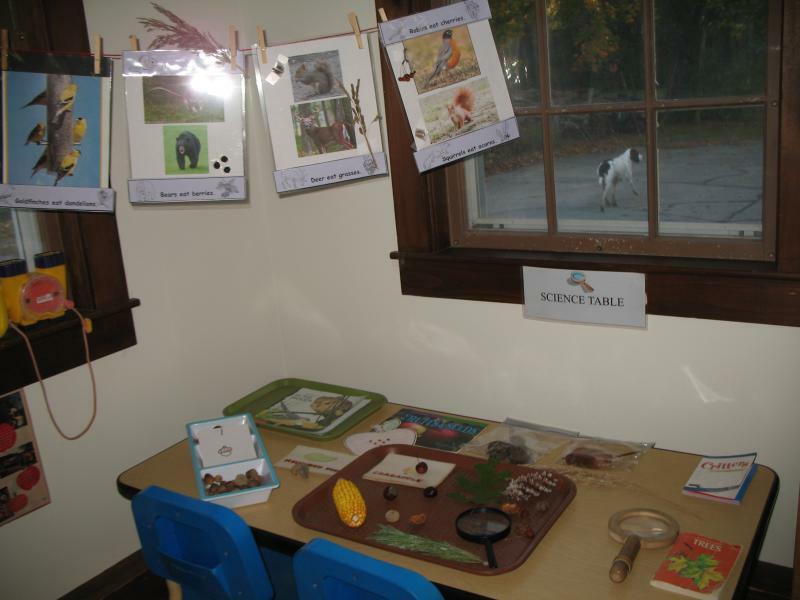 The Winnetuxet Children's Place classroom. This is our quiet and science area.